Wednesday was the beginning of the shopping trip for us galz! Along with seeing their great sister, Aoife and Aisling also came to Spain to complete the mission that is getting jeans/clothes that actually fit them. Being the skinny minis that they are, Spain is the perfect place for them to shop as they are the same size as most fully grown Spanish women. Wednesday also happened to be Halloween which meant shopping for a costume. Of course with Spain being Spain the Halloween shop was closed for siesta by the time we got there...at 2pm. 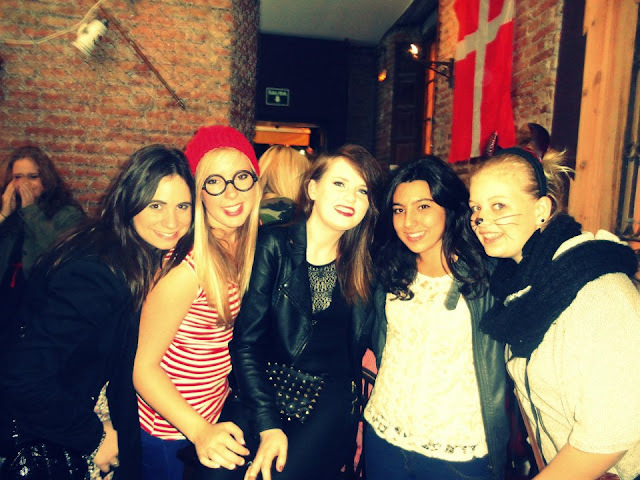 So in the end we ''dressed up'' in the clothes we bought that day. Myself as a doll, Aoife as a person from the 60's and Aisling as a spider. Once again, spooky. Here's the one picture I managed to take on Halloween due to the fact that I forgot to charge my camera. I'm great. Thursday was a gorgeous day in Málaga. Alas, Aisling wasn't feeling too hot so was bedridden for the day. Aoife and I made a trip to the pharmacy to grab some Panadol while also stopping along the way for a lovely fry. Aisling was brought back some ice-cream and was nursed back to health for the rest of the day. That evening we went for a lovely meal in a place called Terra Sana which is situated in a gorgeous part of the city. Thursday was the 1st of November which meant the start of Movember. There was a shave-off event in one of the ERASMUS bars so we popped in there for a look-see. It was strange to see some of my hairier male friends become hair free and look more boy-like than man-like. It's really great that there is charity work going on in our ERASMUS group and I can't wait to see all the moustaches at the end of the month. Saturday more shopping had to be done and the galz' last night here to be hit hard. Once again we hit up Morrisey's. This time with some of my ERASMUS friends. Later in the evening myself, the galz, Helen and Rose went to Roadhouse. Roadhouse is without a doubt one of my favourite bars in Málaga. It's a rock bar but they mostly play golden oldies such as MJ, Prince and Stevie Wonder. They have a stage to dance on too, which is the best part. Then Sunday came. Departure Day. Breakfast was had for the last day at La Canasta, a visit to the Alcazaba was made and my sisters left me. I really had an amazing week with The Two. I love them with all my heart! In other news, I can now look forward to Christmas. I am so excited for this year to be reunited with family, friends, food and my car. Yep. A lot coming up in the next couple of weeks with weekend trips to be taken, Barcelona to see and Christmas shopping to be done. I also get to download Christmas music now. Beyond excited for this and the fact that I'm turning 20. P.S. hello to you and your hairstyle. Thanks Purtill. I like this ^_^ keep it up!